This record is quite sought after amongst 60s garage collectors and it was a recent purchase for me. I don't know how many were pressed in 1967 but my copy looks like new, so was pleased to add it to my archives. The Centurys were a mid 60s combo from Lebanon, PA and this was their last 45. According to details online here they broke up due to the draft and lack of success. Previous singles on Renco and Swan were equally good albeit with a primitive lo-fi production especially on the Renco releases. Back in the mid 80s Bona Fide released a four song EP titled "The Renco Demos" in a rather cool picture cover. The Centurys certainly look the part in their tight jeans and slicked back hair. 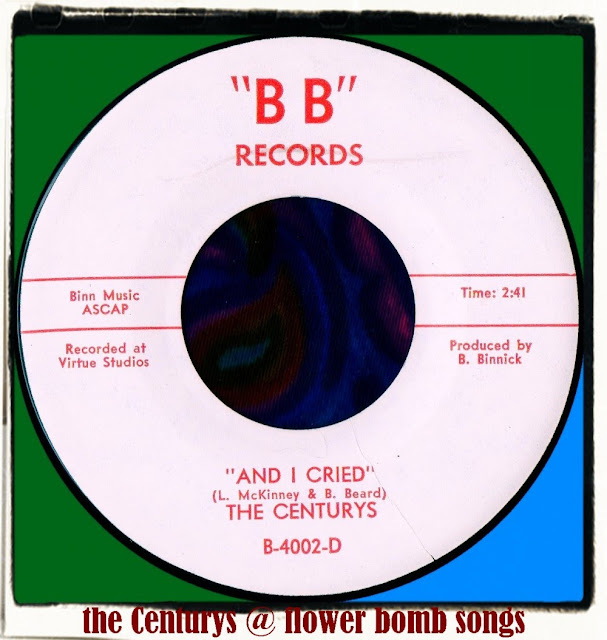 'And I Cried' is a classy fuzz punker with organ which was compiled decades ago on 'Return Of The Young Pennsylvanians'. The flip 'Catch Me Fast' is a pleasant Beatlesesque rocker with harmonies and remains uncompiled.